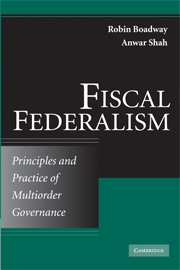 In the new issue of Governance (July 2010), Larry Schroeder of Syracuse University reviews Fiscal Federalism: Principles and Practice of Multi-Order Governance by Robin Boadway and Anwar Shah. Schroeder says that the book “fills an important void in the literature . . . a very complete and balanced review” of the principles of fiscal federalism. Read the review. Grace Skogstad‘s Internationalization and Canadian Agriculture: Policy and Governing Paradigms provides “an invaluable guide” to the ways in which Canadian agricultural policy has responded — or not — to international pressures, according to Tim Josling of Stanford University. Read the review. 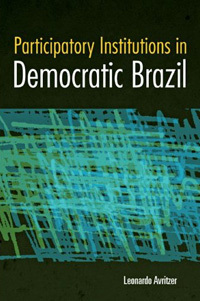 David Rosenbloom says that Leonardo Avritzer‘s book Participatory Institutions in Democratic Brazil “significantly advances conceptualization and theorizing with respect to participatory democratic institutions,” while Angela Wigger says that a new volume edited by Mark Blyth provides “an erudite and elegantly written” overview of international political economy. 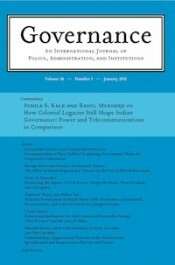 Also reviewed in the current issue: Rosemary O’Leary and Lisa Blomgren Bingham on collaborative public management; Stephen Haggard and Robert Kaufman on the political economy of welfare in the developing world; Rachel Epstein on liberalization in Eastern Europe; and Steven Cohen and William Eimicke on contract management. Read all of the reviews for free in January. In the current issue of Governance (22.3), Matt Andrews says that Donald P. Moynihan‘s book The Dynamics of Performance Management “breaks new ground in addressing questions about why performance management reforms are often adopted in limited forms, why these reforms seem to deliver different results to those expected, and how the value of these interventions might manifest in unexpected ways.” Also reviewed in the current issue: Dan Breznitz on the state’s role in nurturing the high tech sector; Jon Kvist and Juho Saari on the impact of EU institutions on national social protection systems; William Nordhaus on the case for carbon taxes; Lucia Quaglia on Europe’s central banks; David Richards on the condition of the Westminster Model; and Einer Elhauge on problems of statutory interpretation. Read the reviews here.